Do you know why the chicken crossed the road? Do you know what the deal is with airplane food? Do you know what happens when the priest, the rabbi and the minister walk into the bar? If not, maybe you should hit the books at these ten funniest schools. The comedy programs, classes and nearby comedy clubs will help you perfect your comedy skills. You’ll end each performance in a shower of roses and not rotten tomatoes. Find your funny bone at one of the top 10 colleges for comedy. Combining the second-oldest theater department in the country with UNC’s Creative Writing program creates the interdisciplinary major Writing for the Screen and Stage. This focus of study prepares students for writing the funniest shows on television. Need any evidence that the program works? Just ask UNC grads Andy Griffith of The Andy Griffith Show and Adam Reed of Archer. 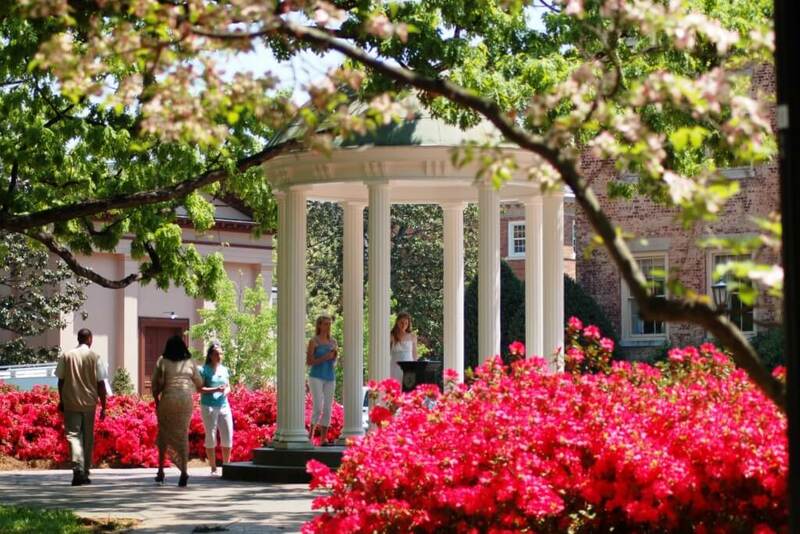 UNC also offers two classes, The Ethics of Standup and the Philosophy of Comedy, for students to explore just what makes jokes funny. This is the only time explaining the joke makes it funnier. Plus, you get to sit around and analyze how comedians like Richard Pryor, Louis CK and Chris Rock perform as a part of your coursework. You’d do it anyway, so why not do it in school? In town, the DSI Comedy Theater teaches classes and offers performances in improv and stand-up. There is no minimum age for audience members and no drink minimum, so you can perform for audiences of all ages and backgrounds. You better dust off those Spongebob references and Disney jokes for family performances, and check the crowd for minors before you use any four-letter words. At Arizona State, you can get paid to think you’re funny before you even leave college. Every summer, the Arizona Sate Comedy Contest hosts a weekly competition for comedians where the first place winner gets $500. So much better than just getting voted class clown senior year in high school. ASU students are also active in open mics in Arizona’s major cities. “On any given night of the week it’s likely that you won’t be able to attend any open mic in Tempe, Scottsdale or Phoenix without seeing a member of ASU Comedy perform,” Noah Hunt, a director of the improv troupe Barren Mind, said. ASU’s comedy troupes Barren Mind, Farce Side Comedy Hour and Standup vs. The World are all resources for budding ASU comedians. “In college it’s too easy to feel stupid or inadequate, so we’ve found that one of the best ways to bring joy to our audience is to make them feel smart. We pride ourselves on keeping our comedy clever while still being sure to cater to a variety of interests and be enjoyed by anyone regardless of their background,” Hunt said. There might not be a comedy major for students at UCSD, but studying theater can still get you performing at a comedy club. Don’t fear—you can skip the Classics classes taught by the dusty old guy whose best friend is the plaster bust of Shakespeare on his bedside table. UCSD offers classes like Improv 101, Performing Standup Comedy and even a class on the humor styles and techniques of the great Woody Allen. One of the improv troupes on campus, FOOSH, lists their interests as improv, comedy, chocolate milk, Batman, things made of gold, cupcakes, baby sloths, breadboxes, furniture, superheroes and bears (so you know you’ll get a well-rounded experience). 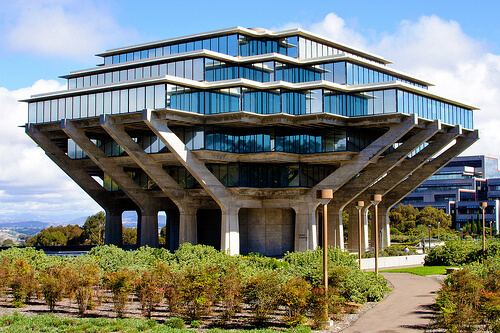 A tough crowd just makes a tough comedian, so UCSD is the place to learn. “UCSD students trying to make it in comedy have the benefit of facing a crowd that knows what it finds funny. They won’t laugh at just anything,” FOOSH president Rithvik Shankar said. Triton Fest, a comedy festival on campus, gives college performers the chance to open for big headliner comedians, like Bo Burnham, who performed last year. San Diego has a growing improv community and with Sidestage Improv and Finest City Improv only ten minutes from campus, students continue to learn and perform after graduation. At Indiana, the classes Acting V and Acting VI teach you to write and perform comedy. After a class of learning how to believably slip on a banana peel, you can head to a comedy extracurricular like Full Frontal Comedy. They’re an improv troupe specializing in “long-form, deep-dish ‘Chicago-style’” improv. “FFC’s style of improv is one of my favorite parts about FFC. It’s also a big reason why we attract a large and diverse audience,” FFC member Kyle Gelfand said. “We like to do real scenes, scenes that people can relate to.” Off campus, the Comedy Attic puts the small town of Bloomington on the map as a major comedy scene. The club hosts an open mic every Wednesday, so you can crack all the jokes about the exact material of Donald Trump’s hairpiece (dryer lint? Tumbleweed?) that you want. The Comedy Attic also hosts the Bloomington Comedy Festival, an annual competition open to comedians of any age. A homemade trophy created by host and owner Jared Thompson goes to the winner. One year, the trophy was a perfect replica of Bernie from Weekend at Bernie’s. Just sayin’. Ever heard of a curly-headed goofball named Andy Samberg? Are SNL and Parks and Rec ringing any bells for you? How about the prestigious Tisch School of the Arts? All of these big names belong to NYU, but it takes more than a name to make someone laugh (unless it’s Seymour Butts). 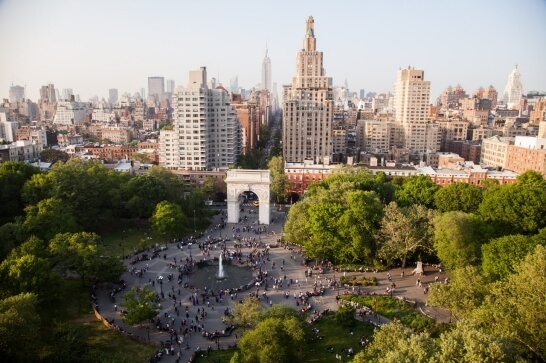 NYU’s program lives up to its reputation and churns out stars with every graduating class. Professor Rosemary Quinn teaches Advanced Improv and goes beyond your typical Harold technique. “Quinn’s class gave me a new understanding of what it meant to be on stage and to perform something truthful,” Jacob Dysart, a member of NYU’s improv team, said. With all the competition comes even more opportunity. Among NYC’s hundreds of comedy clubs is Amy Poehler’s brain child, the Upright Citizen’s Brigade, with open mics every Thursday, and Gotham Comedy Club, where Comedy Central and Last Comic Standing have hosted events. On campus, there are 12 active comedy troupes to choose from, assuming they’ll choose you. 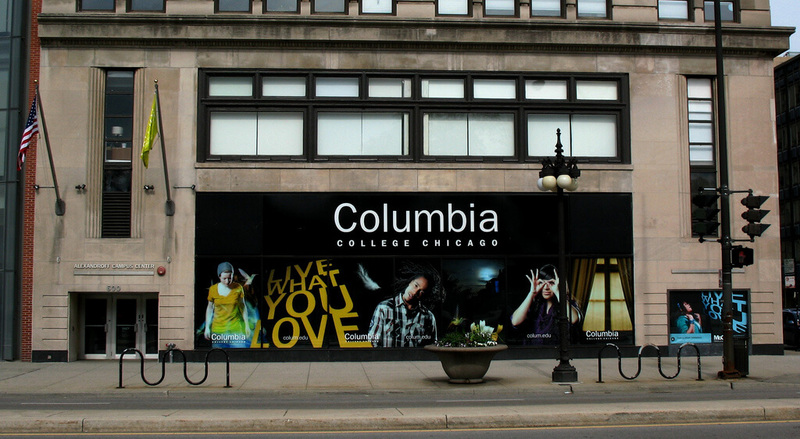 Emerson College will be home to a new Comedic Arts major in Fall 2016. The classes under this major will include Why Did the Chicken?—Fundamentals of Comedic Storytelling, Performing Improv Comedy and Comedy Writing for Late Night (Emerson grad Jay Leno must be the inspiration for this course). Students can peruse the American Comedy Archives on campus to brush up on their skills or just to have a good laugh. Students can perform at Tiki Hideaway Grandma’s Basement on Thursday open mics, or learn new skills at ImprovBoston’s acclaimed comedy training program. Emerson’s students are seriously funny, but they don’t take themselves too seriously. “There was one SwoMo rehearsal where we kept entering scenes with water in our mouths without telling our scene partners, and then suddenly we would open our mouths and the entire troupe would burst out laughing. It happened three or four times. Not the most productive rehearsal, but I was laughing so hard that tears came out of my eyes,” said Kenzie Woodrow, president of SwoMo, an on-campus improv troupe. 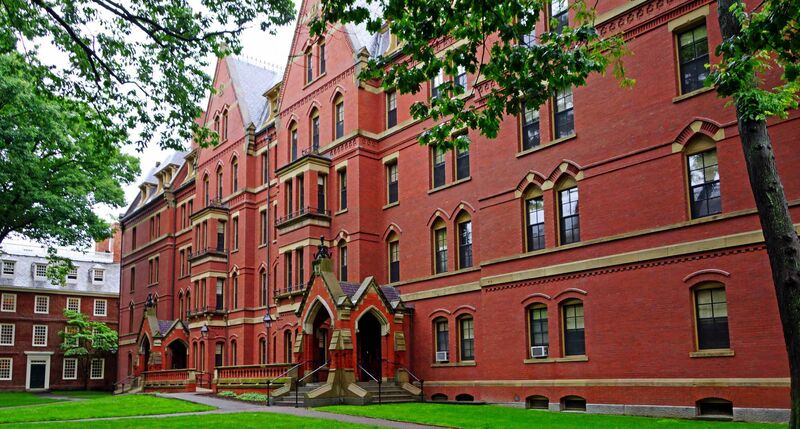 Harvard’s most famous alumni include Conan O’Brien, Greg Daniels and BJ Novak. That’s right—Harvard’s braniacs have jokes too. Harvard has always been a feeder school for the writers’ room of SNL thanks to its famous publication the Harvard Lampoon. These writers are painfully witty, and some are as sharp with delivery as they are with the pen. “Comedy writing is probably more popular here than at most colleges, just because of the Lampoon. We have a bunch of people try out every semester,” Lampoon writer Mark Steinbach said. In Harvard’s improv troupe, Immediate Gratification Players, your “czar” leads you in improv, but only if you’re one of the two to four people, out of 60 candidates, to get a unanimous vote from all of the players. Boston and Cambridge are considered incubators for new comedy talent, so only the best of the best from Harvard get their break in these cities’ hotspots. Who’s on first? USC. The first Comedy program in the nation, that is. The Comedy program is a part of USC’s School of Cinematic Arts. Students learn the writing, directing, production, history and theory of comedy through classes such as Writing the Comedy Sketch Show and Writing the Situation Comedy. USC also boasts an impressive list of both alumni and faculty who starred in shows like Freaks and Geeks, Fresh Off the Boat, The George Lopez Show and The Big Bang Theory and movies like Juno, Bridesmaids, Austin Powers and Tommy Boy. The LA campus forms a comedy rivalry between USC and UCLA. It’s a battle for laughs, and it’s sure to leave you gasping for air. The LA campus also means USC students are privy to all of the comedy clubs the city has to offer, plus their resident celebrity comics. Using the USC name to call up famous comedians to offer their expertise or perform on campus might be more enticing to those stars if the campus is right in their backyard. You know how Friends can make you laugh, cry, ponder the meaning of it all and then end with a laugh all while condensing a plot into less than thirty minutes? UCLA teaches you how to write that episode. You know how Jim Carrey makes you laugh simply with his ridiculous, exaggerated body movements? Be prepared to learn that kind of physical comedy. With its wide range of comedy and humor classes, UCLA creates comedy superstars. Legendary professor Tom Orth is an ageless (although probably ancient) forest sprite who does headstands in class and teaches more about life than comedy in his two classes. The only way to get into his fully enrolled classes is to track him down on campus and beg for a spot. UCLA students definitely have a leg up over everyone else trying to make it in LA, with student comedy troupes hosting events at the Improv Space in Westwood. “You have all of the leverage and connections to get funding, rent venues and book big name comedians to do shows for little-to-no pay,” Austin Nasso, president of Shenanigans, a student improv group, said.